There was a thriving export of manuscripts from Bruges made particularly for the English market, with texts specially adapted for use in the diocese Sarum (Salisbury). With a calendar of the year including feasts of saints such as of Edward Martyr, Dunstan, Augustine (‘Apostle of the English’), Alban, Thomas Becket, Edward the Confessor, and more. 220 x 150 mm. – 112 leaves, 16 full-page miniatures, 14 large illuminated initials with full borders. This manuscript's miniatures were painted by the so-called Masters of Otto van Moerdrecht, whose style was very popular in the Northern and Southern Netherlands from the 1420s. It is a characteristic style presenting elongated figures set in summary landscapes against skies of burnished gold, in variations of standard compositional patterns and lively colours. This atelier's name derives from work in a manuscript made in 1424 for Otto van Moerdrecht, canon of Utrecht cathedral (Utrecht, University Library ms. 249). Illuminators applying the Moerdrecht-style were found all over the Northern Netherlands. Their work was so popular that, in fact, Bruges painters felt threatened by their competition. In prohibiting the import of foreign single leaves in 1427, Bruges' city authorities tried to protect their own products. The result was, however, that now some Dutch illuminators moved south. Bruges' new regulations required illuminators to stamp each single sheet with a registered mark to identify it as a local product: here, a faint red stamp of the letter b can be discovered in the lower right corner, bearing witness to 'the letter of the law'. The Moerdrecht-style workshop was productive in Bruges after 1427 until about 1436, when a crisis ended activities. 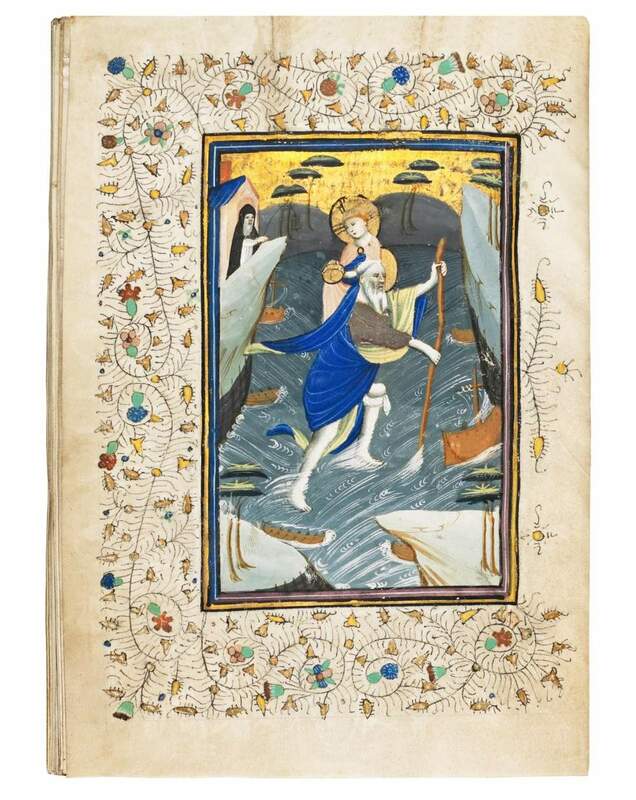 This dates the present Book of Hours likely to around 1430. John Pullan or Pulleyn of Scorton (1559-1618) was the inheritor of the present Hours. He was the son of William Pullan and Margaret Belasyse, Richard’s sister. The Pullans owned Scorton and other lands in Yorkshire. Around 1574, John married Mary Tempest of Broughton. As the Tempests and Pullans were staunch Roman Catholics, this medieval prayerbook would have been a cherished object. However, their faith came at a cost and soon after John’s death, the Scorton Pullans disappeared from the Yorkshire gentry. In order to pay the heavy fines for non-attendance at church, John gradually sold all his lands. How serious the remorseless ruin to his otherwise law-abiding relations was is witnessed by the deeds of the Pullans’ kinsman Guy Fawkes, whose parents also lived in Scorton. His (failed) Gunpowder Plot of 1605 is still commemorated in Britain every 5th of November.